On August 15, smiletravelvietnam.com officially announced to offer a discount of 35% for all tour packages. The promotion is valid from August 15 till the end of September. To book a tour in Ho Chi Minh City, customers can access the website or contact with Vietsmile Travel at 75 Doc Ngu Street, Ba Dinh District, Hanoi. Tourists who want to visit Vietnam will get a good chance at this time. On August 15, smiletravelvietnam.com officially announced to offer a discount of 35% for all tour packages. The promotion is valid from August 15 till the end of September. As a bonus, smiletravelvietnam.com offers late summer trip deals, supplying up to 50% off for hotel rentals in such tourist attractions as Hanoi, Ho Chi Minh City, Danang, Nha Trang, etc. 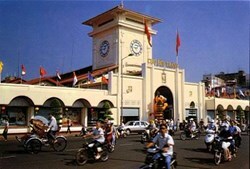 Smiletravelvietnam.com, operated by Vietsmile Travel JSC, provides many attractive tours in Ho Chi Minh City. All are available on the website. Since the number of tourists traveling to Ho Chi Minh City is increasing, the website arranges different tours at various price levels. The website also provides travel guidelines to support customers. Before booking a tour, people can seek for useful information on this interesting destination. Named as the "Pearl of the Far East,” Ho Chi Minh City now is a commercial, scientific, technological, industrial center of Vietnam. This is a place of numerous world-famous tourist attractions. Some can be named here such as Reunification Palace, Botanical Garden, Notre Dame, Ben Thanh Market, Cho Lon (Big Market), Thien Hau Pagoda, Cu Chi Tunnel, etc. Ho Chi Minh City has another name “Saigon.” Once upon coming to Saigon, tourists are deeply impressed by the interesting lifestyle here. It is the mixture of modernity and tradition. Pavement café, street food, and floating markets are some of the interesting things that make Saigon unique. Ho Chi Minh City is also seen as the paradise of shopping lovers because it is home to famous fashion shops and boutiques. Tourists can discover many other interesting things when visiting Ho Chi Minh City. With Vietsmile Travel, it is not a dream to have a tour in this beautiful city anymore.